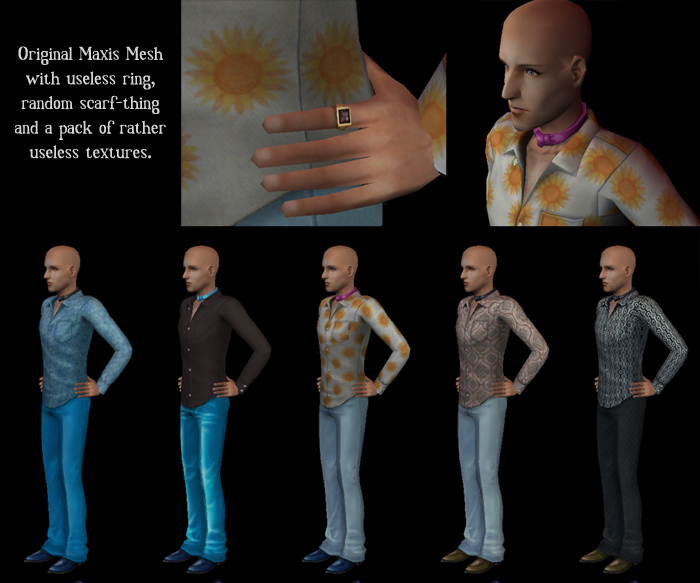 Right, well, when I got Open for Business, I loved the shape of this body mesh, but I was utterly perplexed by the ridiculous scarf-thing, the random ring, and the weird and entirely useless textures Maxis used for them. So, in the interests of making them actually usable, I did a replacement pack. Default replacement version (for OfB): I have done a new mesh which will replace the default, removing the stupid scarf and the ring. In order to get them to go away entirely (as there were still shadows left on the textures even with those mesh parts removed) I had to do default replacement textures, and in doing so, I thought I'd make some much more simple, understated, useful recolours. These will ENTIRELY replace the five Maxis outfits already in your catalogue and will not have a * on them (they'll be in with the Maxis clothing) and only work for adults. The mesh will also work for any other recolours you may have, though if they left on the scarf shadow and ring shadow on their texture, it may look a little odd. You may have to clear out the contents of your My Documents/EA Games/The Sims 2/Thumbnails folder (delete all the .package files within - they just regenerate so this is perfectly safe) for the new textures and mesh to show up properly on the thumbnails, but they should work regardless on your sims. The default replacement version requires Open For Business! Remember that if you do recolours based on my new mesh, you'll need to direct downloaders to my mesh to make sure your creation looks the same in their game as it does in yours. These recolours, being default replacements, will -not- pack with sim uploads, so if you want to share a sim wearing one of these outfits, you'll need to link downloaders to get this pack separately (or in their game the sim will be wearing one of the ugly originals). 2161 polygons, 1635 vertices (lower than the original by a few). Has a fat morph - not Maxis dumpy "I'm pregnant with a throw pillow" fat but more just a normal, non-slim body that contrasts nicely with the extra-slim body shape of this mesh. Tiggerypum, for teaching me almost everything I know about meshing. Dr Pixel, for all kinds of various bits of useful meshing info that have helped me along the way. Everyone who has contributed to the creation and development of SimPE. Ralph Fiennes as Lenny Nero from the film "Strange Days"